Scanner and manage assets in the field. The Barcode Essentials product you need depends on the version of Symantec Management Platform you use. Barcode Essentials 1.x is an add-on for Symantec Barcode Solution 7.1 / 7.5, and provides an iOS app for iPhone, iPad, iPad mini and iPod touch, plus a server side solution you can use to manage device licenses. To use Barcode Essentials 1.x you must own at least one license of Symantec Barcode Solution (e.g. acquired as part of ITMS or AMS or as a standalone license from Symantec) and Symantec Barcode Solution must be installed on your server. Install Barcode Essentials Solution Version 1.x on your Symantec server. Get Barcode Essentials for iPhone app from App Store on your iOS device. You will also need at least one Barcode Essentials 7.1 - 7.5 device license. Barcode Essentials 7.6 & 8.0 are new products that take the place of Symantec Barcode Solution and provide seamless integration of barcode-based asset management workflows for all ITMS 7.6+ & 8.0+ users. To use Barcode Essentials 7.6 & 8.0 you only need Symantec CMDB which you can obtain as part of ITMS, AMS or CMS or in a custom bundle from Symantec. 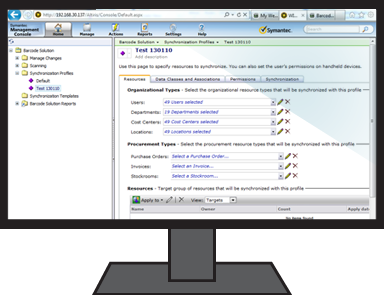 Barcode Essentials Solution Version 7.6 or 8.0 installed on your Symantec server. Barcode Essentials for iPhone app from App Store on any iOS devices. You will also need at least one Barcode Essentials device license. Note that Barcode Essentials 7.6 & 8.0 are new product lines, not an upgrade from Barcode Essentials 1.x releases, so all 1.x licenses must be crossgraded before using Barcode Essentials 7.6 or 8.0. Crossgrade offers are available for both Symantec Barcode Solution licenses and any existing Barcode Essentails 1.x device licenses you own. Visit the Crossgrade Offers page for details. Showing differences between Barcode Essentials products, and comparison with Symantec Barcode Solution. * Distributors include select Symantec Professional Services partners. Contact us for more information. ** Customers already running an older version of Symantec Barcode Solution on Windows Mobile devices will be able to synchronize their devices with Barcode Essentials 7.6 following a configuration change on the device. Contact us for details. It's the fastest way to get moving with asset management in the field, by building on the CMDB infrastructure you already have and eliminating the need to buy new hardware by turning the iOS devices you already own into all-in-one barcode scanners. Receiving stock, allocating assets to users, managing simple daily updates and auditing what you have are just some of workflows that you can achieve with Barcode Essentials™ - and for the first time, with very little set up or training required. Best of all you can try Barcode Essentials by downloading it from the Apple App Store directly to your own iOS device. All app features are available without restriction for 7 days, at no cost to you. Would you like to run a proof of concept for your management team? Ask about our Free Enterprise Trial option today. The moment new assets enter the organisation is the right time to scan and identify them, and mark their location and status before distributing them to stockroom or to users. 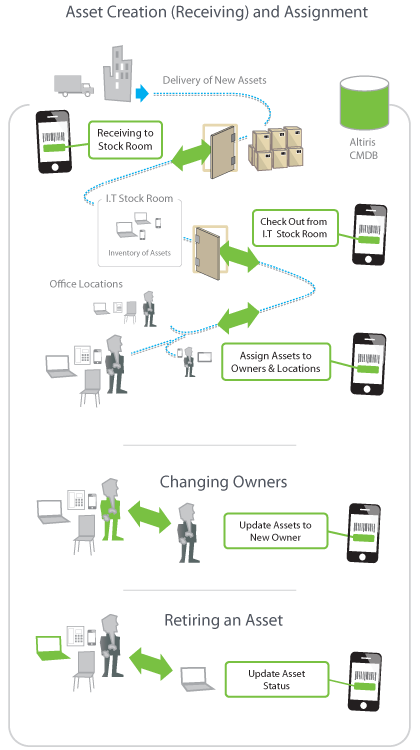 Assets are then checked out from Stock Room and made available for distribution within the organization simply by scanning and updating their location and status. Once an asset is delivered to its intended user, its owner property can be updated or confirmed for accurate reporting and cost center allocation. Where assets need to be re-assigned from one user to another, simply scan them to update the new owner detail's. An asset's End of Life has direct implications for ledger accounts, depreciation and insurance. Dispose of an assset by scanning and updating the final status and location. Your Asset Management Server is where all your critical asset data is stored and updated as users synchronise asset detail that have been modified using Barcode Essentials™. Watch our 'How to' video and see how to achieve a basic setup including how to create Synchronisation Profiles and complete data synchronization.